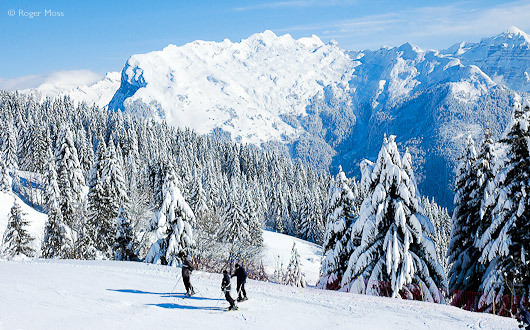 Les Carroz is just a ten minute drive from the A40 motorway exit and Cluses rail station with high-speed links to Paris, while Geneva international airport is just a 45-minute drive, making Les Carroz and other ski villages in Le Grand Massif very attractive to travellers from the UK. Snowfalls here are significant, and there’s lots of variety for mile-hungry skiers. Particularly good for early intermediates. 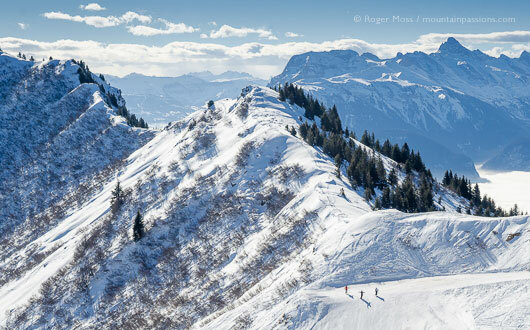 With access to 265 km of slopes in the Grand Massif, culminating at an altitude of 2,500 metres, Les Carroz enjoys an exceptional location on a wide, sunny plateau to the west of the domain. Beginners and novice skiers will find plenty of variety among the pistes above the village, all of which are accessed by the Kedeuze high-speed gondola. Neighbouring Morillon provides safe intermediate territory, and mile-hungry skiers or those seeking steeper terrain can cruise over to Flaine. The Grand Massif is renowned for its level of snow cover and the runs back to Les Carroz are snow-sure for all but the tail-end of the season. We found the terrain close to Les Carroz undemanding but fantastic in bad weather when the tree-lined pistes offer greater security. Finally, there’s also extensive cross-country terrain, plus dog-sledding and guided snow-shoeing (including evening treks to a mountain chalet for a traditional Savoyard meal). Despite rapid development, the village retains an authentic mountain village atmosphere. Easy access and a short transfer from Geneva airport. Highest of the villages in the Grand Massif, Les Carroz retains many traditional Alpine chalets at its heart. Although there’s modern construction too, the village still has an authentic mountain atmosphere. A good variety of shops, bars and restaurants are mostly situated around the village centre. A frequent shuttle bus service covers most parts of the village and takes skiers to the base of the main lift, where there’s car parking with ample spaces at all but the busiest times. Childcare facilities are in a purpose-built crèche where children can enjoy their first activities on the snow in a secure area with rope tow and heated rooms in a quiet part of the village. Why go skiing in Les Carroz ? A Famille Plus Montagne resort, Les Carroz guarantees activities and services for all ages and is particularly known as a family resort with advantageous pricing and flexibility on lift passes (children, beginners and family passes). For independant travellers Les Carroz has an all-in-one booking system on its website, enabling visitors to book transport, passes, equipment, lessons, accommodation, childcare and activities in advance of their arrival - a great time-saver. Couples will value the freedom and flexibility on offer and will enjoy varied skiing and, if you want it, plenty of luxury accommodation options. The Oasis freestyle snowpark and boarder cross also has a speed experience zone and WiFi hotspot with video area. Lots of information for disabled skiers in one place on the Grand Massif website. Drop-off point and free parking at the Kedeuze gondola. 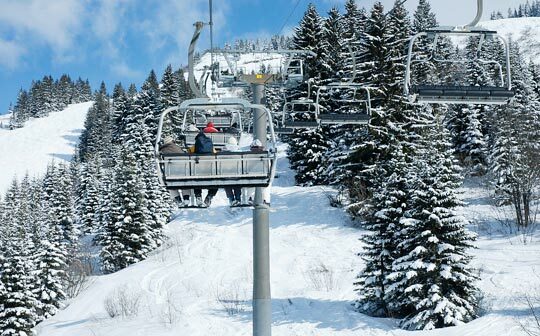 Direct access to most pistes in Les Carroz and the >Grand Massif via the Kedeuze gondola and Moulins chairlift. Download a piste map for disabled skiers here. Preferential 50% ski pass price for disabled skiers, see tarifs (conditions apply). Ecole du Ski Français (ESF), offer ski lessons or contact the Guides Office +33 (0)4 50 90 06 55 or email contact@grand-massif for more information. Big-mountain skiing, combined with friendly village atmosphere. Efficient lift system with well-planned piste layout. 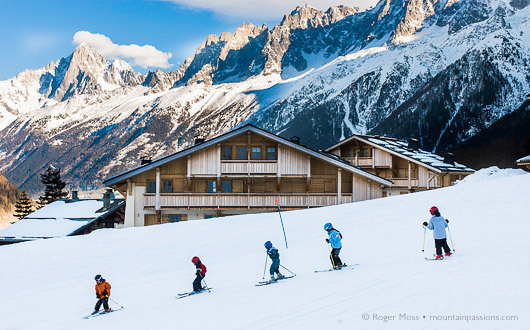 Get back to the village on skis with guaranteed snow on two return pistes. Free parking and regular shuttle buses. Key liaison lifts and pistes can get overcrowded. There’s a lot of skiing on this side of the mountain, so if you’re on a tight budget the cheaper Forfait Massif lift-pass might be all you need. 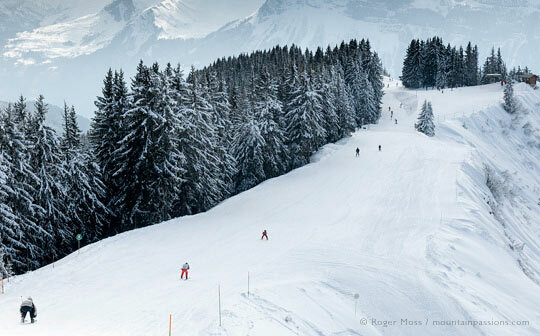 The forested pistes of Les Carroz are ideal for when the weather closes in or there is poor visibility. Les Chalets de Jouvence prestige residence offers 35 luxurious apartments combining traditional architecture from Savoy with high standards and modern facilities. It’s conveniently located at the foot of the slopes, near the Kedeuze cable car, giving access to the Grand Massif area, and just a 5-minute walk from the village centre. The ESF Kindergarten meeting point is very close to the residence and adjacent to the ESF ski school office. There’s a leisure centre with luxurious indoor heated pool, sauna, steam rooms, fitness suite and Spa and Beauty treatments where you can book massages, treatments, body wraps etc. (payable). The lounge area with open fire is cosy and welcoming and you can get free Wi-Fi here and in your apartment. Covered parking (payable) is strongly recommended as there are limited spaces around the residence. All the stylish apartments are fitted and furnished to a very high standard of comfort and convenience. They have a living area with a double pull-out bed (making up 2 single beds), a fully equipped kitchenette, bathroom with hairdryer and wc (sometimes separate). All apartments have satellite TV, telephone, internet access socket and balcony offering great views towards the village and the surrounding mountains. Step into the warm and welcoming atmosphere of this dazzling Savoyard chalet hotel at the foot of the ski slopes of Les Carroz and you might be tempted to kick off your shoes and stay for ever. Owners Armelle and Patrick Linglin have created a truly delightful hotel and restaurant with a decor of untreated timber and Alpine granite, plus the warmth of a crackling wood fire. This former chalet d’alpage offers a luxurious and cosy hideaway either in one of the gorgeous hotel rooms above the restaurant or in the seperate chalet. All accommodation is superbly equipped and furnished in a contemporary style within beautifully restored traditional buildings which retain the charm and atmosphere of the authentic chalet. The gastronomic restaurant has a south-facing terrace for sunny days or you can enjoy the warmth of the dining room with open fire. Chef Pascal Flecheau creates modern dishes with a regional character. New from the winter 2018/19 season - a heated outdoor pool with views over the pistes of Les Carroz plus all the facilities you desire for a few hours of wellbeing and relaxtion. Also new to the scene, the Alpine Coaster luge. Set off from the Kédeuze Gondola and climb 350m before a fun run down 850m of twists and turns through the forest. A 4 minute ride costs 7 euros. You can also combine reality and virtual reality where fun characters from local legends appear on the slopes and play among the trees. A Virtual Reality headset, worn as you descend the luge will cost 6 euros extra. Situated at the top of the Sairon chairlift in Morillon at altitude 1600m, L’Igloo is a warm and welcoming mountain restaurant. The food is of the highest quality and reasonably priced. We can recommend the home-made vegetable soup with plenty of grated cheese and fresh bread (a meal in itself for 7,50 euros) or another favourite, Reblochon Quiche served with salad. Other snacks, regional dishes, salads, and a plat du jour are available, plus a selection of delicious desserts. Situated at the top of the cabriolet lift at Flaine, Le Bissac offers a self-serve or restaurant menu in the warm and cheerful chalet interior. Always busy at lunchtimes, you can while away a few minutes at the bar waiting for a table. Good quality food and service, though vegetarians have a more limited choice. Great for an après ski drink, the Marlow is a popular pub with a warm ambiance, and situated in the heart of the village. There are a variety of beers on draught, or choose between mulled wine, cocktails, chocolat chaud ..... and there’s a bistro-type menu to suit all tastes. 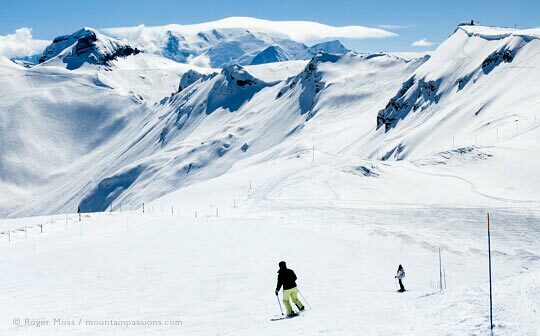 The cheapest and quickest way to reach the Grand Massif from the UK is via a low cost flight to Geneva. 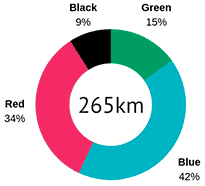 Hire a car when booking your flight or book a taxi in advance. For the Grand Massif travel by Eurostar from London to Paris then take a train from Paris Austerlitz to Cluses. 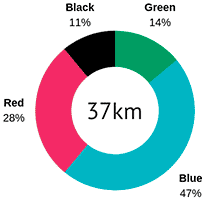 From Cluses take a bus or taxi (20 km). There’s a certain reassurance which comes with the knowledge that you’re heading to one of the larger linked-domain ski areas, not least since the extent and variety of terrain on offer is usually backed up by plenty of options to help decide exactly where to base yourself. Although we’ve come to know the Grand Massif well, the terrain above Les Carroz d’Araches is rather less familiar to us, a situation which we don’t need too much encouragement to remedy. 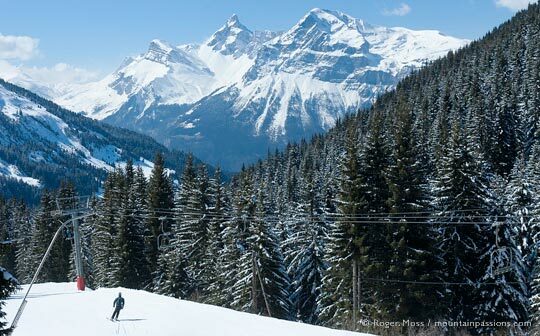 The sheltered terrain among the forested slopes of Les Carroz once again prove their worth, and we have a great time floating around the gladed pistes and barrelling down the run beyond the Gron chairlift. 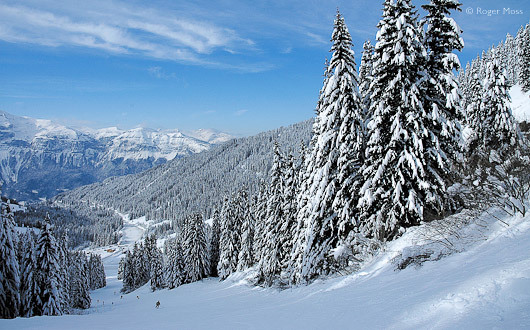 Skiers in Les Carroz benefit from its' forested pistes, especially in poor visibility. An efficient lift system carries skiers back up for another thrilling run on fresh snow. After picking up our Grand Massif lift-passes we head cautiously to the car parking area to don boots and goggles for what promises to be an interesting day. From the vantage-point of the gondola lift it’s clear that visibility is already less than ideal, so for now we elect to stay below the tree-line to take advantage of the sheltered terrain and clearer sightlines. Gliding off into the unknown brings an sense of adventure which is heightened by the near-silence of our progress. Where are all the other skiers? They must be out there somewhere but we’ve yet to see or hear them – not that there’s any lack of other things for us to concentrate upon, as we float around this sector’s tree-lined pistes. Visibility finally opens up just a little after a lunch break, although the forecast is far from encouraging. Times like these are nothing you wouldn’t expect in any mountain area, and they when we encounter them they do at least give us an useful opportunity to see whether whether they create problems for skiers who are new to an area. With that in mind we continue exploring the local terrain above both Les Carroz and nearby Morillon, which both have some reassuringly wide, tree-lined pistes. Before long, however, snow flakes appear and begin to thicken steadily. Visibility is less of a problem now we know our way around, and we just love the magical transition from slightly compacted snow to ungroomed, untracked powder. After the lifts have closed we ski in near-total silence on a deepening carpet of fresh snow all the way back down to just above where our car is parked. Perfect. Decision time: Grenat or Dolomie piste between Flaine and Les Carroz? 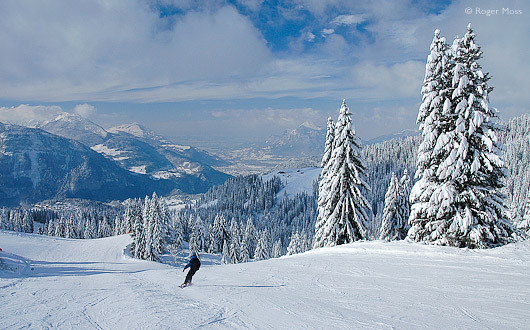 The liaison piste between Samoëns and Les Carroz. Next day finds us out early and keen to head over to Flaine. The improved conditions have brought out more skiers, but with no significant queues for the lifts we make rapid progress. By the time we reach final gun-barrel drop into Flaine Forum the number of skiers with the same idea has increased dramatically, but once we’re down everyone somehow spreads themselves out once again. With plenty of time before we need to think about a lunch break we take the Grand Platières gondola to the highest point (2480m) in the ski domain, and enjoy a couple of bracing runs back down on Faust, still one of our favourite red-graded runs, despite some remodelling in recent years to improve skier safety. When we finally stop for lunch we emerge from the seductive warmth restaurant to the unwelcome realisation that conditions on the mountain are deteriorating once again, so before visibility clamps down completely we decide to make our way back to our side of the mountain. Aided by the 8-seater Grand Vans high-speed chairlift and a couple of flat-out blue cruising runs, we’re amazed how just rapidly the return is accomplished – too rapidly, in fact, so we spend some time back among the wooded terrain we’d enjoyed the previous day. Next morning we retrace our tracks over to Flaine in near-perfect conditions, this time taking the Aup de Véran gondola and exploring the possibilities below the Tête des Lindars (2561m). The high point for us actually turns out to be the lowest, altitude-wise, as the entertaining red-graded Célestine woodland piste swoops through the trees like a boarder-cross run before firing us back out again right beside the village. We’ll do that one again, I think. Our final days in Les Carroz see further good weather before the onset of more heavy and sustained snowfalls, adding a magical transformation to the tree-lined landscapes and giving everyone as much powder as they can handle (and for some rather more..). The sheltered terrain once again proves its worth, and we have a great time floating around the gladed pistes and barrelling down the skier-cross run beyond the Gron chairlift. The real challenge here is not to get around at speed without spinning off, but to do it all without losing concentration due to laughter – both your own, and among those following. Great fun. We leave a still-snowy Les Carroz with heavy hearts, but with a sackfull of happy memories – and consoled by the certain knowledge that we’ll be returning.